Ron Herrmann’s portrait hangs on the School of Law’s Wall of Honor. Pictured with wife Karen Herrmann. Ronald J. Herrmann (B.A. ’57, J.D. ’59), former chairman of bowling ball manufacturer Columbia 300 Inc., will serve as keynote speaker at the St. Mary’s University School of Law’s 84th annual Commencement on Saturday, May 19. St. Mary’s will celebrate the accomplishments of 261 new School of Law graduates, including 11 receiving their Master of Jurisprudence (M.Jur. ), 226 receiving their Doctor of Jurisprudence (J.D.) and 24 students receiving their Master of Laws (LL.M.). Commencement will begin at 1 p.m. at Bill Greehey Arena, inside the Alumni Athletics & Convocation Center on the St. Mary’s campus. Doors open to the public at noon. Media are welcome to attend. The ceremony will be streamed live online for family and friends who are unable to attend in person. Herrmann was the chairman and owner of Columbia 300 Inc. for many years. Columbia was the largest manufacturer of bowling balls in the world for most of this time. He began expanding international sales in the 1970s and organized an export sales division. Herrmann, a San Antonio native whose family has lived in the area for more than 100 years, graduated from Thomas Jefferson High School in 1952, received a Bachelor of Arts degree from St. Mary’s University in 1957 and a law degree from St. Mary’s Law in 1959. He was commissioned in the United States Army Reserve and was the Adjutant General of the Reserve Officers Association of Texas. Herrmann is a member and a founding director of the San Antonio Bar Foundation, a member of the Texas Bar Foundation and fellow of the Texas Bar Association. 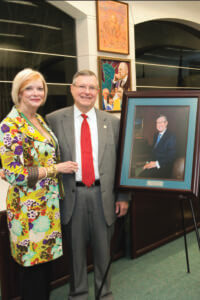 A former member of the St. Mary’s University Board of Trustees, Herrmann was honored as a St. Mary’s Distinguished Law Graduate in 1978 and as a St. Mary’s University Alumni Association Distinguished Alumnus in 2007. In 2011, Herrmann received the School of Law’s Lifetime Achievement Award. Herrmann is currently the honorary chairman of various family-owned businesses.